Mountain retreat! Amazing views of the ski slopes. Shuttle service to the base! 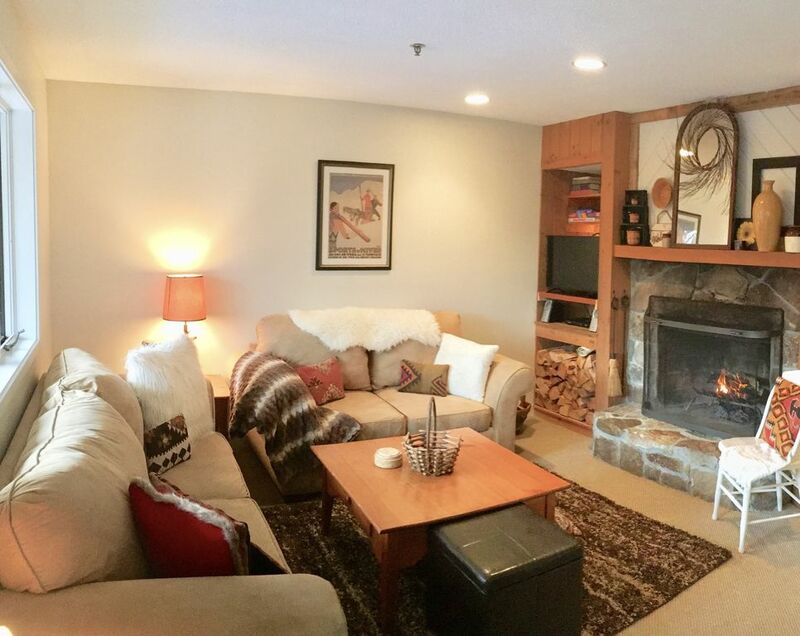 2 bed 2 full bath with beautiful mountain views! This is a newly renovated, top floor property with a layout meant for entertaining and a gorgeous view of Stratton. The kitchen overlooks the dining/living room area which features a warm wood burning fireplace and fantastic views of Stratton. The kitchen is fully stocked with all you will need to cook a meal. The two bedrooms sleep up to 7 people comfortably, ideally 4 adults and three children. The first bedroom features a queen bed and twin bunks and the second bedroom features a king bed with a rollaway. Both bedrooms have their own full bathroom with tub and shower. There is a large entry way/mud room where you can hang your coats and kick off your boots as you start to unwind after a day of skiing. There is also an outdoor balcony with a beautiful view of Stratton if you want to brave a chill with your morning coffee or evening wine. Conveniently located on the first floor, you will find a private closet "locker" where you can store all of your ski gear which makes it very easy to grab your gear in the morning and hop on the 2 minute shuttle which will take you steps away from the main gondola area. A TV with cable and DVD player (with DVD Collection) is located in the living room and another TV with cable and a video game console is located in the bunk room. A small old school boom box is located in the living room. It has a CD player, an AUX plug where you can plug your phone in, and a radio where you can listen to our local alternative station WEQX. WiFi throughout. The condo is located directly next to the fitness center which features a pool, sauna, indoor and outdoor tennis, yoga, full gym, and complimentary coffee and tea. For an extra daily or per class fee you can enjoy all the amenities there. There are tennis instructors on hand to book private or semi private lessons. The Fitness center has a small pro shop and sells some snacks as well. Convenient full shuttle service to the gondola is free to all guests of this property and runs frequently on all holidays and weekends. There is also a complimentary weekday shuttle service available to guests. Other nearby attractions include Bromley ski area, (17 minute drive) Mt. Snow ski area (14 minute drive) and Manchester Village (26 minute drive) where you will find many restaurants and shopping opportunities. There is also a movie theater and a skating rink in Manchester along with museums and art galleries. Manchester is known for it's outlet shopping so this can be nice for a day you do not plan to ski. The Appalachian Trail and The Long Trail pass through Stratton. You can pick up the Catamount trail about a 15 minute drive from Stratton. There is so much cross country skiing around Stratton at the Nordic Center and also a short drive in Peru, VT (where the 80s movie "Baby Boom" was filmed) you will find Wild Wings which offers both cross country skiing and yoga in front of a toasty wood burning stove! The village of Stratton has several very good restaurants, shopping, and a general store. Just a short, 5 minute ride away in the town of Bondville is a larger general store, several ski and sport shops, a pub, a pizza place, and a 7-Eleven where you can purchase gas, wine, beer, and spirits. There are ski rentals available in Bondville as well as up at the base of Stratton. Come and enjoy this very warm and cozy winter get away! Clean, cozy and very welcoming!